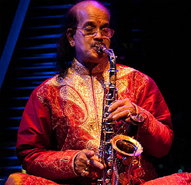 Kadri Gopalnath is an Indian saxophonist and one of the pioneers of Carnatic music on the saxophone. He acquired a taste for music from his father Thaniappa, a nadhaswaram vidwan. Young Gopalnath once saw the saxophone being played in the Mysore palace band set. Thrilled on hearing the vibrant tone of the saxophone, Gopalnath decided to master it. It took him nearly 20 years for him to conquer the complex western wind instrument and he was eventually crowned as the "Saxophone Chakravarthy". G.Manikanth Kadri- Software Er., Composing music for Telugu & Kannada Films, (Keyboard, Sax). Initially he learnt from his father Thaniappa. Gopalnath learnt the instrument under Gopalkrishna Iyer of Kalaniketana, Mangalore. In Madras, Gopalnath came in contact with the mridangist T.V. Gopalkrishnan who identified the youngster's potential and tutored him. He studied S.S.L.C. (10th Std.) in Sharadha High School, Pane, Mangalore. Titles and honors have come his way, the most cherished being the Asthana Vidwan of Sri Kanchi Kamakoti Pettam, Sri Sringeri Sharadha Peetam, Sri Ahobila Mutt and Sri Pillayapatti Temple. He was awarded the Padma Shri in 2004. Gopalnath has the distinction of being the first Carnatic musician to be invited in the BBC Promenade concert in 1994, in the Royal Albert Hall at London. The Asian Music Circuit, U.K, sponsored his recital. Among his other distinctions are: Saxophone Charkravarthy, Saxophone Samrat, Ganakala Shree, Nadapasana Brahma, Sunada Prakashika, Nada Kalarathna, Nada Kalanidhi, Sangeetha Vadya Rathna, Karnataka Kalashree in 1996, Vocational Excellency Award from the Rotary of Madras, Tamil Nadu State Award "Kalaimamani" and Karnataka Rajyotsava Award in 1998. He received an honorary doctorate from Bangalore University in 2004. The 2008 album Blue Rhizome by the New Quartet features a tribute to the saxophonist called "Gopalnath"